During the past decade ska appeared to be a dying genre with only a few bands still actively churning out new tunes to skank to. However, “the times they are a changing”. Over the past year, Five Iron Frenzy announced their return to both touring and the studio and The Inzyders released The Sinner’s Songbook in September. Now The O.C. Supertones have their newest musical endeavour, For the Glory. The Orange County Supertones’ original band members, reunited back in 2010 and played a handful of shows. March of 2012 saw die-hard fans wishes fulfilled, as The Supertones announced their plans to try and fund a new album through Kickstarter. I admit that I had some degree of apprehension in the months leading to the album release. The entire music scene has radically changed during the years between The O.C. 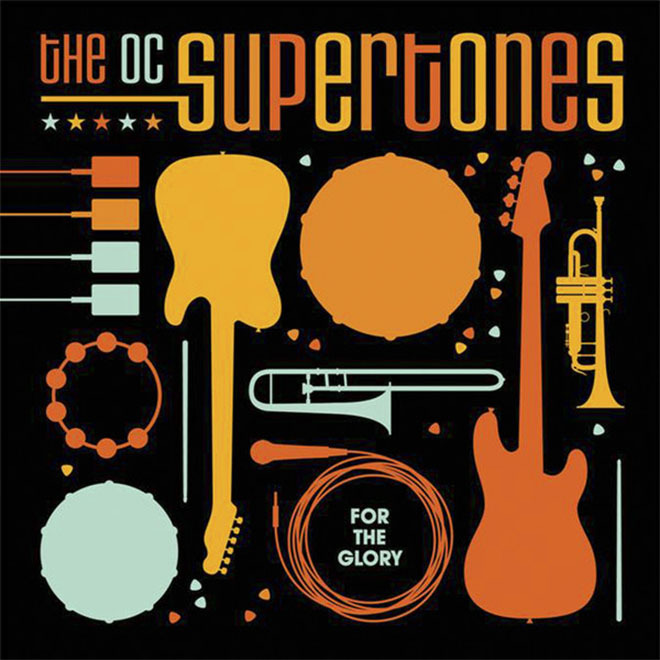 Supertones last album and For the Glory. Would The Supertones change as well? That apprehension was erased upon my first listen to For the Glory. The new release has delivered to dedicated followers a faith filled, ska extravaganza. The same type of sound that put The O.C. Supertones at the top of Christian ska craze at the turn of the century. The Supertones borrowed the great guitar skills of Josh Auer of PAX 217 fame as both producer and guitarist on For the Glory. His talents, in both roles, shines through. The band also dished out a few musical surprises on the new album. “All the Way Alive” is the blockbuster opener on For the Glory. Matt “Mojo” Morginsky’s vocals fill the listener in as to why The Supertones reunited and why they perform. We do it for the love, we do it for the Lord, we do it for the people cause they want some MORE! We do it for the fame of the Most High, so come on inside and get all the way ALIVE! “For the Glory”, the title track from the new album. Why read about it when you can see and hear it? Check out the video. “Hey Hey Hey” with Mojo providing a staccato rap vocal delivery on this light and bright tune. Mojo sends out a tribute to important women in his life, his mother, daughter, and sister on “Far More Beautiful”. The lyrics directed to his mother struck home with me. “Down to the River” lyrically takes you back to the style of song you may have learned in Sunday School in your younger years (albeit, this time with catchier beat). The worshipful song “All Glory” should be added to your worship leaders repertoire. Go ahead and ask, you might be surprised! “It’s a Good Day to Be from California” has the band sending a lyrical accolade to their home state with a fun pop, surf rock vibe. “Warmth of the Sun” is one of the oddities on For the Glory, as the band delves into an acoustic, folk sound reminiscent of ’60s folk artists. “On the Downbeat” was the teaser track for the new album and the catchiest song on the album. This track is guaranteed to have you singing along. “Fight On” draws out some of the punk edged ska that the Supertones have offered up over the years as the lyrics equate our modern world to the ancient days of Babylon. “Pretty Little Lie” recounts the emptiness in Mojo’s past and the fulfillment he received in Christ. Another of the surprises by The Supertones with a mandolin opening for “The Wise and the Fool”. The refrain taken directly from Joshua 24 “as for me and my house, we will serve the Lord”. Simply put, this is an outstanding album for ska lovers such as myself and for those who are new to this revitalized genre, by the masters of the ska craft, The O.C. Supertones. Grab a copy of For the Glory and start skankin’, ska is back!